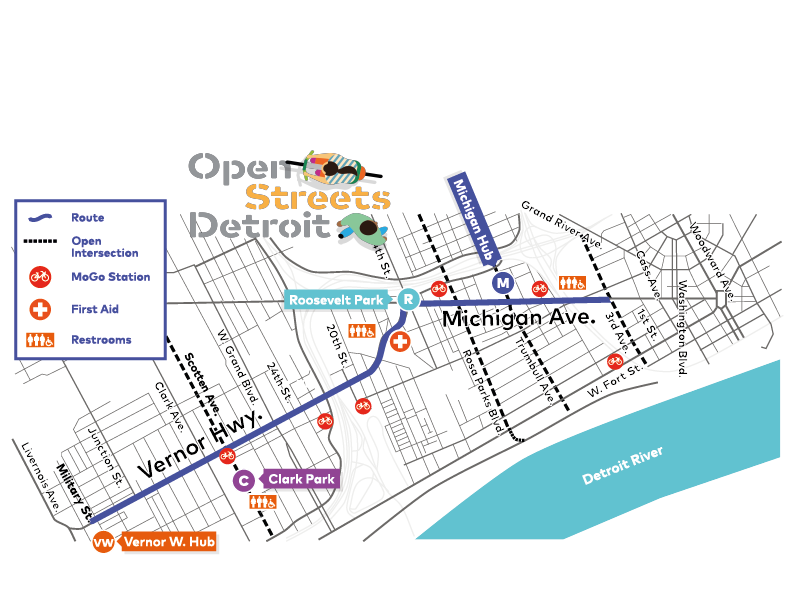 Open Street Detroit - Southwest will tentatively cover approximately 3.5 miles along Michigan Avenue and West Vernor Highway. The proposed route will begin at the new Beacon Park at First and Grand River in Downtown Detroit and connect to Michigan Avenue through Roosevelt Park in Corktown, and will continue on West Vernor Highway through Southwest Detroit to Military Street. Dozens of shops, restaurants and businesses line Michigan Avenue and West Vernor Highway. From BBQ and bagels in Corktown, to tacos, barbers and beauty shops in Southwest Detroit, the route features a diverse range of neighborhood retail. Several cross streets will remain open throughout the closure of Michigan and Vernor, as will all side streets and parallel roads. For people driving to Open Streets, a list of suggested parking along the route will be posted . Keep checking the website for additional Frequently Asked Questions and answers.